I posted this once before, but since it is no longer in my archives I will re post it because I simply loved this article. As a work at home Mom who has had , in the past, a few friends who have been less than understanding about why I can't talk on the phone for hours during the day, or go shopping and out for "dinner and a cocktail" every week, this article was one I could relate to. Do moms use their kids as an excuse to relax?... Um, NO NO NO!!! Are you serious? Did those words actually come out of this lady's mouth? Unbelievable! Relaxation is a dream for most stay at home moms with small children. Most of us choose to be SAHM for many important reasons. But relaxation is not of them. It is to the point and keepin' it real! 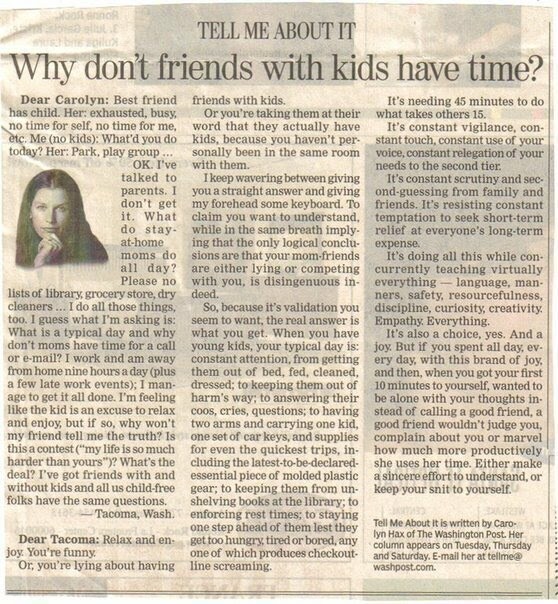 There was a time in my life when all my "friends" thought I was the go to babysitter for when their kids were sick during the school day, or when their kids were out of school on holiday and the parents weren't, or just cause their regular sitter for their little ones (not yet in school) cancelled on them that day. Don't get me wrong, I didn't mind helping out my friends when they were in a real jam (and I still do), but some abused this all too often. Funny, they never seemed to understand that I still had a homeschool to run and it would be extrememly hard for my kids to focus while the others were playing, or that (while I was sorry their kids were sick) the last thing I wanted was for mine to get the flu or strep too, or that I actually would like a break from time to time to take more than a 5 minute shower, use the bathroom in peace, enjoy a lunch with adults and adult conversation everyone once in a while, and all those other things we SAHM's never seem to get to do! Pauline, there are no words to express how genuine your words of understanding come across in your comment above. I am remembering your recent post about being led by His spirit. You have been in true touch with the Master Himself! I am currently going thru a major overhaul in certain parts of my life. Especially in the childcare department. I am certain I never mentioned in my new blog, but I for sure did a few times in my recently accidentally deleted blog. I am currently running a small childcare service in my home and (of course) too many months later, have come to the realization that this was just all too much for me to handle. I just KNEW I could do it... I am "Super" Mom after all, Right?... Wrong! About 3 months ago I told the clients I wouldn't be able to take care of the children anymore, and here I am 3 months later, still in the same boat! However, there is a light at the end of the tunnel, His plan is coming into effect! Praise Jesus because I need a break! We had school today and all the public schools were closed so we had a day of freedom from the other kids. Boy, what a difference! What a wonderful, productive, fun, beautiful day!